Check out our books, seminars, and even gift certificates. 52-ways to create fun, meaningful, memorable meetings that your employees will love. 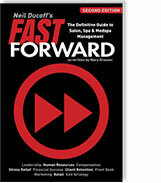 Fast Forward is your map – a pathway through the fog of growing a salon/spa business.